I've been to two brilliant film previews in the past two weeks: Goodbye Solo at Soho House and Glorious 39 at the Soho Screening Rooms. Goodbye Solo won the 'Fipresci' International Critics' Prize at last year's Venice Film Festival, and is the latest film from young, internationally-acclaimed filmmaker Ramin Bahrani - recently hailed “the new great American film director” by eminent critic Roger Ebert. 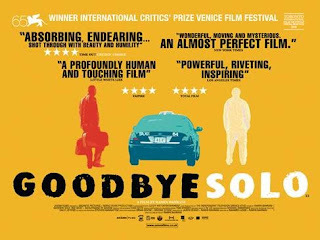 Featuring the irresistible pairing of first-time actor Souléymane Sy Savané with former Elvis bodyguard Red West, Goodbye Solo is an uplifting exploration of morality at the very heart of a poignant tale of unlikely friendship. Solo, a Senegalese immigrant driving a taxi in North Carolina, has aspirations of becoming a flight attendant and help provide a better life for his pregnant wife and step-daughter. One night he picks up William, a tough Southern old-timer with a lifetime of regrets. One man‘s dream is just beginning, while the other‘s is quickly winding down. But despite their differences, both men soon realize they need each other more than either is willing to admit. Through this unforgettable friendship, Goodbye Solo skillfully explores the passing of a generation as well as the rapidly changing face of the world we live in. It's in cinemas from 9 October - go, see. Savané is excellent and the scenes are so well orchestrated, most of the drama lies in what's left unsaid - the tension between the two men as their relationship strengthens and the grim realisation unfolds is palpable. 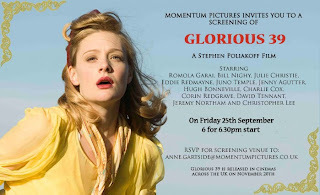 Glorious 39 started on a cheerier note, before descending into a bleak insight to the beginnings of WWII - equally grim and equally excellent. The British thriller, written by Stephen Poliakoff, is set in London and the idyllic Norfolk countryside when Britain stands on the brink of war. Prime Minister, Neville Chamberlain, is at the forefront of the movement to appease Hitler whilst others, with Winston Churchill as their powerful figurehead, believe that war is essential to combat the Nazi threat. The story is centred around the formidable Keyes family, who are determined to preserve their very traditional, English way of life in the midst of this political uncertainty. The adopted, eldest sibling Anne is a budding young actress in love with Foreign Office official Lawrence. Anne's seemingly perfect, carefree life surrounded by friends and family, begins to dramatically unravel when she stumbles across secret recordings hidden by outside forces in the out-buildings of the family home. Whilst trying to uncover the origin of these recordings, a tangled web of dark secrets begins to unfurl, along with a growing sense of menace of betrayal. As war breaks out Anne flees to London in an attempt to confirm her growing suspicions of evil at work. Only then does she begin to discover the true extent to which she has been betrayed. A beautifully shot film with a stellar cast, stunning wardrobe and a very interesting subject; you can't not like it. Apart from the ending, which was disappointing. But still: out 20 November - put it in your diary.